We have a week to go until the 2014 MLB season concludes and the MLB postseason kicking off. While the races this year have not been as crazy as some in years past as the Baseball Prospectus postseason odds show only have three teams in baseball outside the postseason with some semblance of a chance, there is still much to be decided in a short amount of time. Here's my look at the races down the stretch. In the National League, virtually everything is set in place. The Nationals have won the NL East while the Cardinals and the Dodgers have clinched playoff spots. Both of the latter two, barring some sort of a collapse, should feel comfortable in getting to the division crowns as St. Louis has a three game cushion on Pittsburgh and Los Angeles has a 3.5 lead on San Francisco. The Brewers are still technically alive to get a wild card berth but with how brutal they have looked over the last month, I would be stunned if they picked up the 4.5 games that separate them from the Pirates. In the Junior Circuit, the action is a little more exciting but unlike in the NL, there are two divisional races that are all sealed up. Baltimore and Los Angeles of Anaheim both sailed to the East and West division crowns. 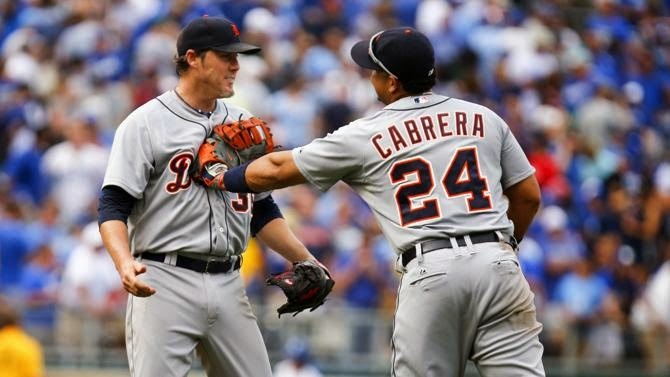 In the Central, the Tigers hold a 1.5 game lead on the Royals after taking two out of three in Kansas City. Detroit does have the tiebreaker given they have gone 13-6 against the Royals this year and I expect them to hold on for the division. The American League Wild Card race is going to be by far the best race to watch down the stretch. Both Kansas City and Oakland, who is tied with Philadelphia in the fifth inning at the moment, sit at 84-70 and they sit a 1.5 ahead of Seattle. Cleveland also sits 3.5 games back of the wild card as well. Kansas City and Cleveland will play three times this week but they are also finishing a rain-delayed contest in the bottom of the tenth from August tomorrow, with Kansas City down 4-2 in the bottom of the tenth inning. With the Indians going 9-6 against the Royals, the Royals better not sleep on their division rivals in their quest to get to the playoffs for the first time since 1985. That said, I do think the Royals will hold on to get one of the wild card spots. The other will come down to the A's and the Mariners and while I think the former has a slightly easier finish to their season (three games against the Angels at home and four against the lowly Rangers in Arlington) than does Seattle (four games in Toronto and three at home against the Angels), I also do not have all that much confidence in the A's given how awful they have looked and given that they were just swept by the Rangers at home (and outscored 19-6 on the way). But given that Seattle hasn't looked that great of late either (dropping two of three this weekend in Houston), I am tentatively giving a slight edge to the A's. So there you have it, one potentially wild finish in the AL and snoozefests everywhere else. If you don't mind staying up, you may just be rewarded.